President of Azerbaijan Ilham Aliyev arrived in the Nakhchivan Autonomous Republic for a visit May 16. President Aliyev was welcomed by Chairman of the Supreme Assembly of the Nakhchivan Autonomous Republic Vasif Talibov. 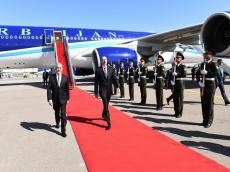 A guard of honor was lined up for the president at the Nakhchivan International Airport. President Aliyev met with members of the government of the Nakhchivan Autonomous Republic.